Every time I've written any kind of post on Zero-Waste, somewhere in the article or caption I give my Zero-Waste experience a caveat by explaining that I haven't gotten my waste down to a mason jar like other leaders in the area. Anyway, I started my #MasonJarChallenge in March for the very first time and I definitely filled my jar, so I've got some work to do if I want my trash for an entire year to fit in a jar. I learned a lot along the way - where my trash is coming from, what I can avoid and what I can't, etc. Below is a recap of my trashy ways for the last month! I initially was planning on putting tissues in my jar, but my allergies are still too whack to do that, and it would get gross and out of hand very quickly. I also didn't include condoms - because - gross as well. I was talking with a friend the other day and she pointed out that she was wondering about tampons, pads and other period related things. I don't have any of that to put in the jar - because I already have a Zero Waste period. We got take-out a few times. Once, food was purchased for me because I'm mostly vegan and we went to Carl's sister's baby shower and there wasn't any food there for me to eat so her Dad went and got me some Mexican food. I wasn't about to be like, "Could you also make sure not to use a bag or get any napkins or silverware? Thanks." I took the food and was extremely grateful for the thought, and actually I think all that came with it was the bag - which I recycled with plastic bags & film. We went to Crack Barrel on that same trip and I ate biscuits with blackberry jelly [not vegan, I know] and I only brought one of the blackberry jelly containers home to fit in my jar and forgot the other one on the table. We also picked up carry-out from Solstice in our neighborhood twice. We get it without utensils, napkins or the bag - but the food comes in styrofoam and as you'll see below, I cut one of those up to fit in my jar, but didn't do that with the second one. I plan on asking them if they'll consider switching to compostable take-out containers and if they say no, then we'll just need to eat our food there if we REALLY don't want to cook. I also did not include any trash that was not technically produced in March. I did some decluttering this month, as always, and threw away some things that have been in my house for years that were not recyclable, compostable or donate-able. And lastly, I did not include anyone else's trash - namely my husband's, although he didn't produce much trash at all, so at some point I'll lump him into this experiment as well. This month was JUST my trash and only the trash that I created in this month - except for the few things I already listed above. Ok. Let's get to it! The Styrofoam container from Solstice. That Veggie burger with Tots is my current Go-To meal when I haven't shopped or meal-prepped and I don't feel like cooking. We did this twice this month, not too bad, but I think if we get to this point we just need to make a rule to eat our food there. Because usually, I've been at home all day in my PJ's and make Carl go pick it up, so if I REALLY don't want to get dressed, then I'll HAVE to cook something and just get over my super laziness. Excuse the mold - I should have rinsed off these seals before putting them in the jar. I know for next time! These are the seals on containers like Vegan butter, Coconut ice cream, Coconut Yogurt, Peanut Butter, Maple Syrup and Vegan Mayo. There's nothing I can do about the Vegan options except stop eating them, which I'm not going to do. There aren't any stores in Charlotte where I can purchase those things loose, especially vegan options. When I go to Asheville, I can get maple syrup in bulk, but in between trips, the kind I buy has a seal on the glass bottle. There are a few places I can buy bulk Peanut-Butter, but it comes in plastic containers and I'm not sure if they're ok with me using my own jar, like if they'll take the tare out at the register [but it's something I can ask] - some places are SO annoyed by this - even when I do all the work for them, all they have to do is press some buttons on the screen. I could attempt to make my own peanut butter and nut butters as well as my own vegan mayo, yogurt and ice cream, but I'm not going to. I don't currently have that time luxury. I look for items that are sold in recyclable containers and the seals are just trash. In the grand scheme of things, the vegan option will ALWAYS be less wasteful than traditional dairy any day of the week, so there's that too. These are pieces that are straight up trash or pieces of recyclable material that are too small to recycle. I've got bread bag ties in here from two loaves of GF bread, something I can't currently find package free - you can get regular bread package free from tons of places, but the extra layer of it being GF is an added difficulty. There's also retail tag plastic - I honestly have no idea where those came from. I don't recall buying clothing or anything that would typically have those on there. It's possible Carl or I just found those and put them in the jar. The black piece is that weird squishy stuff they put in the bottom of some berry packaging. This summer, I plan on doing SO much berry picking and freezing all the strawberries, blueberries and blackberries my heart and freezer can handle. There's also a piece of glass that broke off one of my mason jars - I recycled the jar, but that piece is trash. And there's the top of a frilly toothpick, unlike Mitch, I'm not for 'em. I couldn't get that plastic off the top, so I cut the top off and composted the rest. That guy was randomly stuck into one of my Veggie Burgers, which isn't usually done. I already shop in three different spots weekly and then also Earth Fare once a month when I want to stock up on dry bulk, so I don't see myself adding another stop for only oil any time soon - just being real. One of these days, I'll do a post that lists out the cheapest places to buy package-free produce, but for now I'll just say - I shop in three places. There's also a seal that was on a glass jar of lemonade. I was super thirsty on our last trip and didn't have my water bottle on me - we were out shopping for the baby shower. I went into a gas station and I didn't want to buy a plastic water bottle - the only things in glass jars were Starbuck's fraps [not vegan] or a fruity lemonade - so I went with that. These are from items that I can't find in bulk or that aren't sold loose, obviously. I won the raffle at Trader Joe's this month and got a prize bag of food that was all packaged, so there's a lot of things in my jar from the prize bag. It was a lot of things I don't usually buy, so I've decided to stop playing the raffle - especially since I've won twice in a year - it's someone else's turn now and I don't want the trash it produces. Some other things in here are the tops from frozen fruit for smoothies, something I can avoid if I just use fresh fruit and then freeze it and the tops off of Vegan or GF packaged food. I could avoid those if I stop eating them because there aren't currently any way to purchase those things package free, but again - I'm not going to do that. Shopping Vegan is WAY less wasteful than NOT shopping vegan. Even if I learned how to make my own Gluten Free bread, I'd still have to purchase GF flours and they mostly come in packaging, so I'm back at square one. I've been taking my plastic bags and film to a recycling drop-off station. I don't know how it actually gets recycled or if it's just green-washing to make people feel good about themselves and the store providing the service. Really the best option is to make sure these things are packaged loose or in compostable packaging. 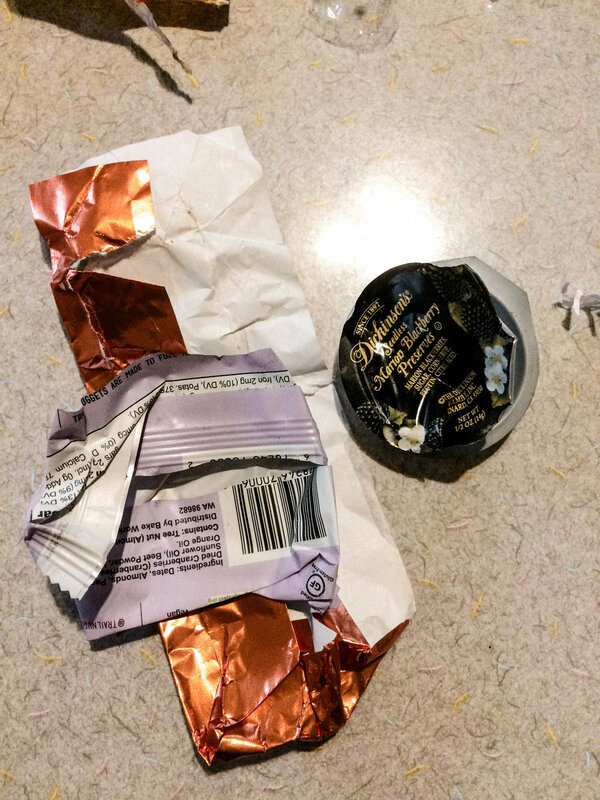 The copper foil paper is from a candy bar from my TJ's prize bag as well as the energy bar wrapper. And the jelly is from stopping at Crack Barrel on our last trip. I'm not a candy bar or energy bar kind of gal - so these things won't be reappearing in my trash, and we couldn't remember the last time we went to Cracker Barrel - which is the only place I use jelly, so that item is not likely to make another appearance either. I generally snack on fruit or chocolate covered almonds from the bulk section. I love the way they taste and don't miss candy bars at all. That being said, if I'm given a candy bar, I'll eat it. It might take me a while to get to it, but I'll most likely eat it. I haven't gotten to the point in my Zero-Waste journey where I refuse things given to me at all times. I don't know if I'll ever get there... especially if it's edible. Carl and I went to Mac Tabby's Cat Cafe as part of celebrating our Seven years of being together and they put these bracelets on us. They aren't recyclable because of the material and adhesive. They use them to show that you've been checked in and that you've signed the waiver, so that they can ensure a random person who hasn't signed the waiver, made a reservation or paid doesn't wander into the cat room. 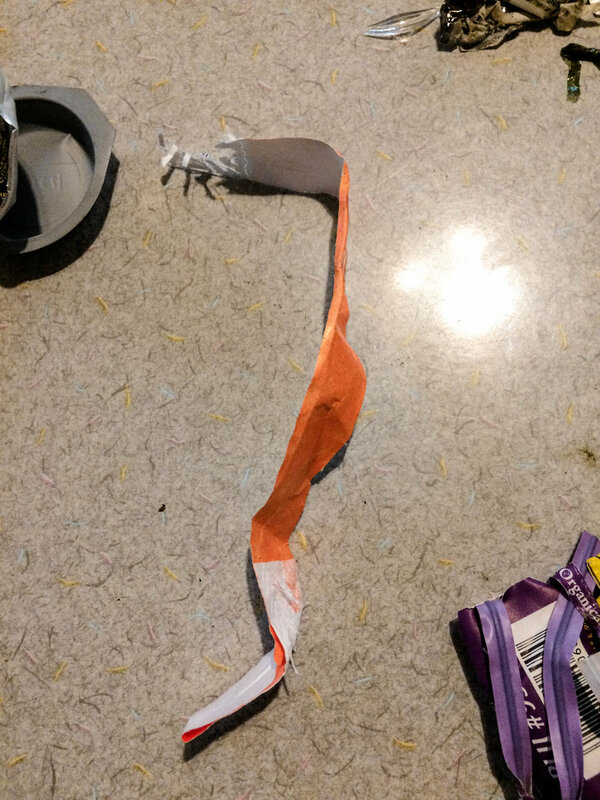 I totally understand the logistics behind that, but since they only let a set number of people into the room at a time, so as to not overwhelm the cats, they could switch to a reusable item like a lanyard and collect them as people leave or use a stamp, although some kind of reusable item would be best. I do Zero-Waste consulting for businesses, if you're reading this, own a business or know someone who does and want to reduce your waste, you can learn more about it on The Podge Co. - my business website. I do my best to buy my greens from my Veggie Farmer. They sell their greens in plastic bags with twist ties, but I return those to them each week for them to reuse. That being said, I Cycle-Synch and they don't always have the greens I need for that week, so I buy them loose at Fresh Market. Sometimes they aren't even at the Farmer's Market if they don't have a lot that week, which means shopping at the grocery store as well. Now that the warmer months are here, they'll be back with more veggies & greens which will help cut back on these twist ties. Buying my greens "loose" still means they come wrapped in a twist tie. I WISH they would be just a regular twist tie, but they usually come wrapped in this paper that gets wet and starts to separate from the wire, they also are attached to large pieces of wax paper that carry the brand name and bar code a lot of the time. If they were just your basic twist tie, I could take them to my Farmer for her to reuse, but I know she's not going to use these branded wet separated paper ones, so they go in the trash. And last but not least, TONS of produce stickers! The amount of produce stickers will go significantly down once my Farmer has more produce to sell, but in the colder months, this is what I've got. I skip the plastic produce bags and put my produce straight in the cart. The plastic produce bags are completely unnecessary. Just skip them. I also bought a pie, something I basically never do, while Carl was off on his Guy Vacation with his friends a couple of weeks ago. I could recycle the cardboard box, aluminum pie tin and the plastic "window" into the box, but not the stickers and tape on the box, so I removed them and put them in my jar. That's something to pay attention to when recycling. To do it the best way that you can, you have to separate the materials. Most things are made up of several different materials, and although each of the materials might be recyclable, if you don't separate them, it's unlikely the item will actually get recycled. Even then, it's not guaranteed that the item will get recycled - which is why recycling is not the answer. There you have it - my trash for an entire month! Even though there are some areas I can improve upon and some areas I can't really control right now due to lack of resources in the area and in our overall economy - I'm pretty proud of this step! The average American makes 4.5 lbs of trash a day! A DAY! Which means the average American made 139.5 lbs of trash in March while I made, 2.6 OUNCES! That means I made .12% of the amount of trash as the average American last month. That's a HUGE FREAKIN' VICTORY in my book! And that includes the second take-out container not in my jar, I filled it up with all of my trash in the jar and weighed it, and yes it doesn't include the other trash I made that I've already mentioned was not in my jar - but STILL - that's unbelievable! I'm pretty proud of this journey I'm on and can't wait to keep improving! So, what about you? What steps have you taken in your Zero-Waste journey? Were there things NOT in my jar that you're wondering about like my friend was wondering about where my tampons were? If you skipped to the bottom and missed that part, I have a Zero-Waste period, which is why there aren't tampons or pads in my jar. Was there anything else that came to your mind? I'd love to know! I've been doing this for so long now that I'm not always able to remember how I used to make trash, so if there's something you're wondering about, I'd love to share the Zero-Waste option with you! Thank you for reading and good luck with your own Zero-Waste Escapades!